At an early age, Rowe became a draftsman in his father’s building business in the UK. The family emigrated to Australia in 1848. From 1857 until 1895 Rowe practised as an architect in Sydney, Bathurst, Orange, Newcastle and Goulburn. 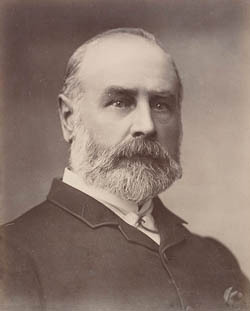 He was president of the New South Wales Institute of Architects in 1888 and was also a Lieutenant-Colonel. Rowe Street (which runs off Pitt Street) is named after him. Thomas Rowe died penniless as a result of the economic depression in the 1890s. On the Early Glebe Architects walk, Rowe’s Old Presbyterian Church is featured.